Daniel Defoe wrote of Woking in the early 18th century: "Woking, a private country market-town, so out of all road, or thorough-fare, as we call it, that 'tis very little heard of in England." 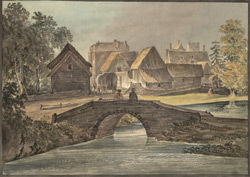 At the time of this watercolour, the town consisted of low-built timber dwellings. The embattled top of the church tower can just be seen, as well as a more modern three-storey building in the background.